The Three Valleys is without doubt the largest and finest linked ski area in the world. The area is naturally blessed with good snow falls and, along with 2,383 snow cannons, skiing is virtually assured from Christmas through to the beginning of May. The ski area is truly inexhaustible and with 600+km of pistes in the Three Valleys (150km in Méribel), there is something for every standard of skier. 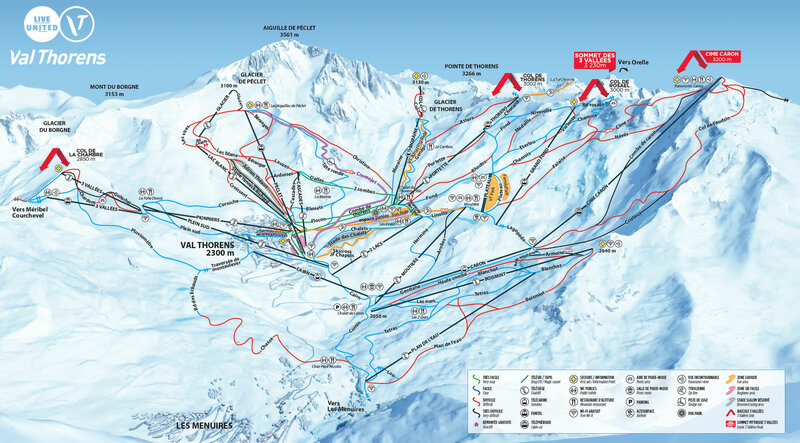 The valleys are superbly linked, with Val Thorens under an hour away and Courchevel even closer. So whether you are looking for beautifully groomed pistes, bumps, steeps, or out of the way off-piste runs you will find it in the Trois Vallées. In Méribel, try the Ladies Olympic Downhill, or the exhilarating runs from the top of Saulire all the way down to Méribel, a vertical drop of 1,300 metres. Then there is Mont Vallon, with its two fabulous sweeping red runs and amazingly varied off-piste. Courchevel has miles of wonderful cruising runs, beautiful pistes through the trees to Le Praz and La Tania, the gentle runs of 1600, as well as the Saulire Couloirs, Suisse and Chanrossa, which will challenge even the most expert skier. The Vallée des Belleville offers some excitingly different terrain. On La Masse and in the Fourth Valley there are some great runs both on and off piste. 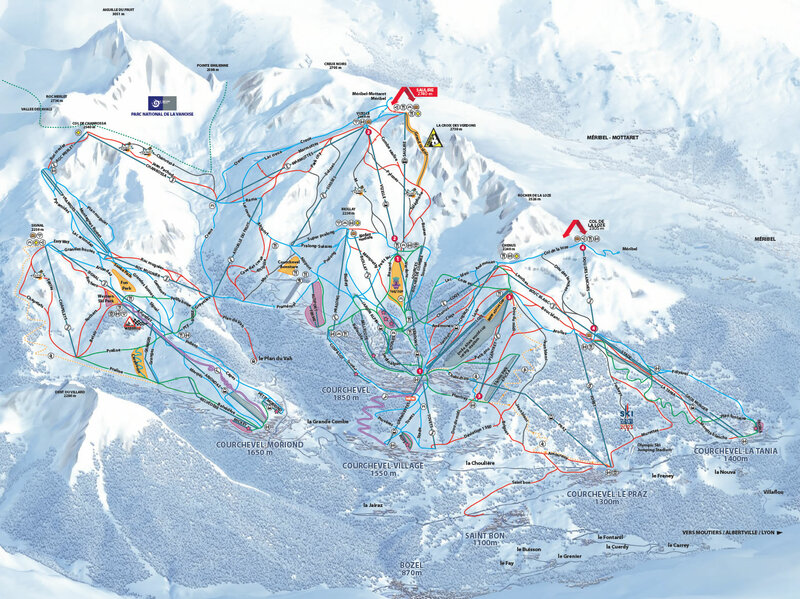 Click here for piste maps of The Three Valleys. Snowboarders – Boarding is very popular in Méribel and is very well catered for in the valley, with many board parks and huge amounts of off piste. Ski Lessons and Guiding – Everybody can benefit from ski lessons, beginner and expert alike. A ski guide can really help you make the best of your time on the mountain, whether on piste or off! Méribel is blessed with a wide choice of superb schools – for more details see our ski lessons section. Lift Pass Prices – For details of lift pass prices please visit the lift pass prices section. 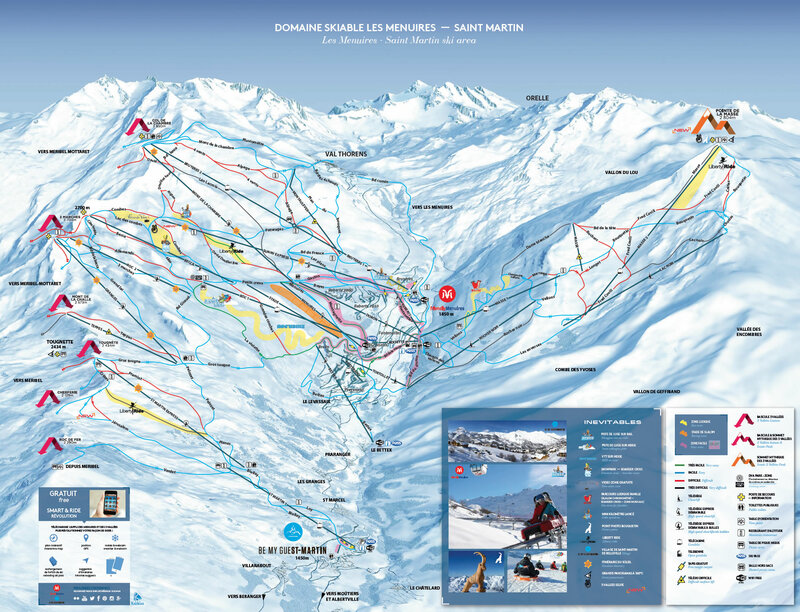 Real time lift openings – For complete details of the pistes open today just click here. We strongly recommend that you book your ski lessons / guides as soon as possible after booking your holiday to avoid disappointment. Please note that Purple Ski is not itself a ski school. This page gives a description of companies providing ski and snowboarding lessons, also private guides in Méribel and links to pages which summarise the hours and prices for both group and private lessons. We are fortunate that Méribel is blessed with several excellent ski and snowboarding schools; we have worked with all the schools listed here and always with excellent results, so have confidence in recommending them to you. We would be happy to provide advice to all our clients regarding ski lessons and help with making advance bookings; Hannah has an intimate knowledge of all the ski schools and lesson options, so please contact her on skilessons@purpleski.com. Alternatively, you may book these lessons directly with the provider (web links and contact details are given below). NOTE: lessons within 2 weeks of your holiday start date should be booked directly by yourself. For a chart summarising the types and prices of lessons offered, click here. Please book your ski lessons at the earliest possible time to avoid your required lesson being unavailable. This is important for all weeks of the season but particularly at New Year and February half term. Morning sessions tend to be the most popular, so tend to be sold out first. Please note that even if a lesson is listed here it does not mean it will be available at your particular week, level, discipline or location. All details are subject to change without notice. NOTE: Helmets are required for all children's’ lessons – and are recommended for adults too! There are many excellent, independent ski instructors operating in Meribel, most used to work within one of the bigger schools but who now prefer to manage their own client base. Here is a list of a few of our favourites, with contact details. For Simon's website click here. Email: info@laraski.com or mike@theindependentskico.com for reservations. For Lara's website click here. For Eric's website click here. For Stephen's website click here. For Stéphane's website click here. For Andy's website click here. For Michael's website click here. Parallel Lines is one of the larger, independent snow sports schools in Meribel. Based in Meribel and run by people who know the area inside out, they have, over the past 18 years, built a great team of 22 (more in peak weeks) fully qualified and mostly (c.80%) native English speaking instructors, selecting those with the experience, personality and passion for the mountain that guarantees consistently great lessons. They offer a full range of adult ski and snowboard lessons throughout the season plus performance clinics, on and off piste guiding and freestyle. In the school holidays they offer a full range of children’s ski and snowboard group lessons but offer children’s lessons most of the season. Their meeting point is at the left hand side of the entrance to the Rhodos bubble at the Chaudanne area. For full details of lessons with Parallel Lines, including 2018-2019 prices, click here. One of the most popular ski schools, Magic (in Motion) has recently undergone a makeover and will be known as Oxygène from here on. Still focused on their core principles of English speaking instructors (with a team of 34-40 instructors - mostly the "old" ones), small group sizes and innovative teaching techniques they are a great option for kids and adults alike. Those familiar with their lesson structures will see some changes to these, with the Little Ones classes being 3 (instead of 2) hours each morning, the "Fun Factory" running for 3 (instead of 4) hours each morning and only ever having one full day, and adult beginners being mornings only Monday to Friday (no afternoon session on the first day). We recommend Oxygène, especially for children and beginners. Little ones are particularly well catered for in the "Magic Garden", a fun enclosed area with special equipment, exclusive to Oxygène. And for older children, their "Fun Factory" has one all day session (including lunch), which they love and enables them - and their parents - to go further afield! The meeting point for lessons in Méribel is next to the bottom of the Rhodos lift. For full details of lessons with Oxygène, including 2018-2019 prices, click here. New Generation is an independent ski school that's been running for over 20 years, that we have worked with very successfully for several seasons. They have 11 instructors based in Méribel (another c.20 based in Courchevel); all are selected based on their excellent coaching skills, most are British – but all speak very good English (so can make analogies and explanations that you can more easily understand, encourage questions and discussion to help you progress faster and hopefully have more fun). Their focus is on “coaching” rather than “instruction”. Their instructors base lessons on the key principles of all learning – a combination of doing, watching, thinking, listening and feeling. All their instructors hold the BASI International Ski Teacher Diploma, membership of the International Ski Instructors Association and full entitlement to teach in France. They run group and private lessons for skiers and snowboarders of all ages and abilities. They also offer clinics for higher level skiers and boarders who want to develop technique or get off a plateau. Their meeting point is on the far side of the bottom of the Tougnète 1 bubble on the Chaudanne, to the right of the entrance to the lift pass office. For full details of lessons with New Generation, including 2018-2019 prices, click here. For ski tips by New Generation, go to this link. Marmalade has a team of 10 great young (ish! ), fully qualified, ski instructors and off piste guides. 7 are from the UK, 1 from France and 2 from Italy, but have been teaching in Meribel for 5+ years so speak English well. All have been working in Meribel for many years. Probably the “coolest” of the ski schools, they have – in our view – a more relaxed approach to teaching and definitely know how to enjoy themselves on the mountain. Read the biographies of the instructors on their website and you’ll get an idea of what we mean! Guest feedback about them has been great. Offering mainly private lessons and off-piste guiding please click here for prices. For group lessons please contact them directly. The ESF is the biggest ski lesson operator in Méribel, offering group and private ski, snowboarding and cross country lessons, among others. They have some 400 alpine and 10 cross country ski instructors. Our past experience of group lessons offered by the ESF in both Méribel and Mottaret has not been great (issues mainly with language and/or excessively large group sizes – especially at peak periods). However they have some excellent private instructors and guides and we would recommend them for private lessons. If you wish to book group lessons with the ESF please book direct (click here); we are happy to help book private instructors. The ESF also operates a creche for children aged 18 months to 3 years (Les Saturnins – Méribel only) and a kindergarten (Club Piou Piou) for children aged 3 years to 5 years. Here, the children can play and try skiing for the first time in the large, enclosed snow field with inflatable figures, snowmen and a ski tow, or play and rest indoors in the air-conditioned “chalet” complete with toys, books, videos and a rest area. Proof of age required for both. For full details of lessons and 2018-2019 prices for private lessons with the ESF, click here. Cab9 Snowboarding is a team of snowboard instructors which has been operating since 2006. As the only officially recognised, dedicated snowboard school in the 3 Valleys, Cab9 has built a great reputation over the last 12 years as the people to come to for snowboard lessons. Their team are all highly experienced snowboarders, who live and breathe the sport. In contrast to much of the snowboard instruction available in France, the instructors are dedicated snowboarders, rather than ski instructors who teach snowboarding. They offer lessons for all abilities, from complete beginners to expert riders. They are able to teach to a very high standard – they are qualified to guide clients off-piste, and are also trained to teach freestyle in the park and pipe. They offer 5 day group lessons, expert sessions. private lessons and freestyle group sessions. All lessons meet at the bottom of the RHODOS lift in Méribel. For full details of lessons with Cab9, including 2018-2019 prices, click here. Sweet Snowsports was founded in 2009 with the aim of providing a fun, friendly and flexible approach to snowsports instruction. Their team of 6 instructors are all native-English speaking, fully qualified and hold the prestigious "French Equivalence". They promise to listen to what you want, using the benefit of their combined 115+ years experience to provide top class service throughout the whole experience. Mainly specialising in private coaching to individuals or small groups (please click here for prices), during school holidays (or when there is demand) they also offer children's group lessons with an industry-leading ratio of 6 children per group. Sweet Snowsports operate across Meribel, La Tania and Courchevel, their instructors know the ski area/infrastructure very well and will be able to identify terrain suitable for your ability and guide you around the vast, world renowned ski area with this in mind. Craig Conkie and Martin Jeffers, two ex-ESF instructors who have been in Méribel for many years, are part of an association called BASS, the British Alpine Ski School. Craig and Martin head a small all British team of 6 inspirational ski coaches who will be available throughout the season, with other British instructors joining them for busy periods. All BASS instructors have the BASI Level 4 ISTD and also have completed their Eurotest (with French equivalence), making them among the highest qualified British instructors available anywhere. They run mainly private lessons in Méribel, but during busy periods offer ski groups for juniors also. They are flexible in the way they set up lessons, meaning that they can often tailor lessons to suit certain parties. If a group has something particular in mind with regards to their ski lessons, they would try to accommodate their wishes if possible. For details of private lessons with BASS, including 2018-2019 prices, click here or call them directly. Please find below ski lesson prices for non-peak weeks for the 2018-19 season. For peak week prices (such as New Year, Half Term and Easter) or for assistance booking lessons please email Hannah at skilessons@purpleski.com. Prices in table are non-peak week prices. For peak week prices (such as New Year, Half Term and Easter) or to book lessons please contact Hannah at skilessons@purpleski.com. Note: some childrens lessons are only available during school holidays. Below is a summary of private ski and snowboarding lessons / guiding offered by the best ski schools in the valley. High season dates are: Christmas and New Year, UK and French half term and Easter. Most schools take a deposit of 100% of the total lesson cost from your credit card to confirm the booking. In general, 50% is refundable should you need to cancel more than 2 weeks in advance. To reserve lessons please email us on skilessons@purpleski.com. Please note that in booking lessons via Purple Ski you must agree to the Purple Ski ski lesson reservation terms and conditions, which can be found here. Please note the above prices are taken from the latest information that we have and are subject to change without notice. If you are unable to view the private lessons table, unfortunately your screen is too small. Please visit our site on a Tablet or Computer to view. A crèche for children aged 18 months to 3 years, run by the ESF offering indoor and outdoor activities (e.g., reading, handicrafts, singing, sledging, walks, games on the snow). Proof of age (e.g., passport) is required. You also need to provide nappies, slippers, teddy bear or comforter, a snack, change of clothing, sunglasses and gloves. A kindergarten for children aged 3 years to 5 years, run by the ESF. Here, the children can play and try skiing for the first time in the large, enclosed snow field with inflatable figures, snowmen and a ski tow, or play and rest indoors in the air-conditioned “chalet” complete with toys, books, videos and a rest area. Male and female instructors supervise, encourage and instruct the little ones in skiing and other games on the snow. At the end of their stay children will win their own special “Piou-Piou” Club medal! Not generally recommended for non-French speaking children! On booking, the ESF usually charges your credit card with the cost of the first day’s lesson (per instructor), with the balance charged to your card just before your arrival in Méribel. However they will refund the full amount charged in the event of cancellation provided they receive 24 hours notice of the cancellation. They will not refund in the event of a “no show”. The Bureau des Guides are the true specialists in off-piste skiing, ski touring and heli-skiing. The guides offer their experience and knowledge of all the best places and hidden spots of the Three Valleys - they know the area better than anyone else - where to find good snow and safe meeting points and are the only ones allowed to take groups or individuals skiing on the glaciers. The guides are in regular radio contact with each other and share information across the ski area every day. For more information, or to make a booking, please visit their website guides-meribel.com/en/. If you want to use the ski lifts to reach the untouched areas of the Three Valleys and ride down the finest off-piste routes, if you love linking perfect curves in untouched snowfields, then your high mountain guide is the expert companion who can bring together safety, discovery and your enjoyment. From the ski lifts of the Three Valleys you can reach the vastness of the snow covered alpine pastures and glaciers in the Vanoise National Park amidst breath-taking surroundings. By using "touring skis" or a "splitboard", with moderate and ergonomic effort in the footsteps of your high mountain guide, you will be completely free to enjoy limitess skiing where the snow is at its best. Heli-skiing offers a wonderful way to enjoy the fresh snow. From the Altiport, take a short (c. 15 minutes) flight and enjoy stunning views to the Italian border and ski back down on virgin slopes with your mountain guide. An unforgettable day. The Three Valley Lift pass system is “hands free”. You simply leave the lift pass in a left hand pocket of your ski suit and the gates automatically open for you. You don’t need to show your lift pass and no photograph is required (except for <5 and >75 years). To pre-book your lift passes either send us an Email with your requirements or else click here and complete the form. We will have your passes ready and waiting for you on your arrival so that you can get straight out onto the slopes without any delay. Note that family passes represent a significant discount compared with individual passes, see below. Every member of the family pays the child price. To qualify, you must be a family of 2 adults and 2 or more children aged 5 to 17 inclusive, and buy a pass of 6 days or greater duration. Reduced prices apply for the period up to 21st December and from 13th April; the prices below are for the main part of the season. Please contact us for the prices of passes not shown below. &ast;Price is per person. To qualify for the family pass, your family must comprise 2 adults and at least 2 children aged between 5 and 17 years inclusive. Note: Minimum 6 days and passports/photocopy of passports (preferred) required. ID required for proof of age. Under 5’s & over 75’s go free. Photo is required for all season & free passes. NOTE: You must have a pass valid for 2 or more days for this; the extension applies to one of the days already paid. Skiing is free in Méribel and the 3 Valleys for those under 5 and over 75 years of age. Proof of age is required. 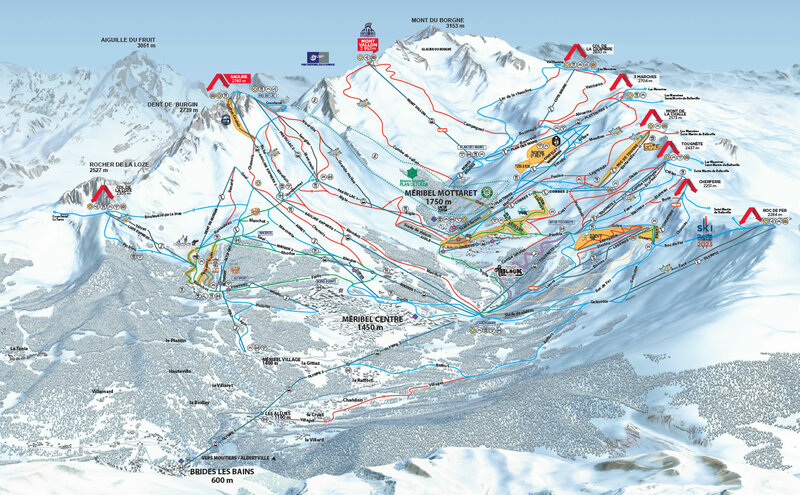 Additionally there are free lifts in Mottaret, at the Rond Point in Meribel and at Meribel Altiport. Having the right equipment, properly fitted can make all the difference to your skiing - which is why we work with White Storm for all of our chalets. White Storm have been providing quality ski rental in Méribel and Courchevel for over 20 years, through their shops and delivery service. They offer superior equipment, along with exceptional customer service and competitive pricing. Upon your arrival you'll find your pre-booked equipment already delivered. Once you have settled in, your chalet manager will liaise with White Storm directly and an experienced English-speaking technician will arrive to expertly fit your boots and check that everything is perfect with your skis or board. The delivery service is supported by their shop in the centre of Méribel as well as a call-out service to the chalet. White Storm believes you should be skiing on the latest quality rental equipment and for the 2018-19 season, all adult skis and boots will be 2019 models. They stock many brands but their favourites this year are Black Crows, Kästle, Scott, Rossignol and Dynastar. Avoid queuing in a ski shop. Have your equipment prepared and delivered by White Storm to your chalet and when you're ready, a technician will visit and check everything fits perfectly. White Storm staff are experienced, English speaking skiers and snowboarders and able to recommend the perfect equipment that'll help you get the most out of your snow time. A flexible call-out service is on hand during your holiday in case you need to change some of your equipment. At the end of your holiday, simply leave all your ski rental equipment at the chalet and White Storm will collect it all for you. If you are looking to purchase new boots during your stay, then we recommend the The Boot Lab in Meribel Centre (they also have a shop at Courchevel 1650). They are without doubt the best fitters in the Three Valleys and offer a comfort guarantee. They can be contacted on +33 (0)6 96 19 95 21 or info@thebootlab.co.uk and fitting appointments can be booked online at TheBootLab.co.uk.